I’m not talking about junior college transfers, I mean five Division I players and a Division II national award winner who aren’t only ready to step in and play but will be counted on for major contributions. LSU has six – three who came in this year and three others that arrived in 2017 and sat out per eligibility rules. Five of them come from each of the other four Power 5 conferences. The presence of quarterback Joe Burrow, tight end Thaddeus Moss, wide receiver Jonathan Giles, defensive end Breiden Fehoko, cornerback Terrence Alexander and placekicker Cole Tracy could hardly have been more timely for coach Ed Orgeron. It’s a transition year for the coach in his second full season and facing LSU’s most difficult schedule since 2011. The offense loses eight starters, the defense six and the depth has once again been depleted by the loss of seven juniors declaring for the NFL Draft. Instead of depending on incoming freshmen or second-year players without game experience, Orgeron is plugging holes with mature bodies that have shown glimpses of making an impact. It’s easily the biggest haul of transfers since the recent relaxing of the rules. LSU got good mileage out of Zach Mettenberger in 2012-13 during a period when it couldn’t land a competent quarterback recruit. But this is different and likely to remain a trend for all Power 5 conference schools with the rules expected to be tweaked again in the near future. LSU shouldn’t count on getting six dependable players like this every year but won’t have to if Orgeron can get recruiting back on the rails. The first major pre-season poll by Sports Illustrated has LSU No. 18, which seems fair with all the starters lost and Georgia’s emergence. The transfers make LSU a dark horse worth betting on. Joe Burrow, QB, 6-3, 214, Jr.: He’s the prize and the key to LSU getting back among the SEC elite. The bonus is the Ohio State graduate transfer has two years of eligibility. Orgeron calls him a “gamechanger” and its clear they intend for him to win the starting job after lackluster efforts by LSU quarterback in the spring. Burrow lost a close battle to Dwayne Haskins in his own spring game, completing 15 of 22 passes for 238 yards and two TDs while showing the ability to read defenses and make accurate throws. Arm strength isn’t his forte’ but neither is it Drew Brees’. He was a four-star recruit who threw for 11,416 yards and 157 TDs in high school and has good running ability, rushing for 2,067 yards and 27 scores. He’s only thrown 39 passes as a college quarterback, but that’s more than LSU holdovers Myles Brennan, Justin McMillan and Lowell Narcisse combined. Jonathan Giles, WR, 6-0, 193, Jr.: Orgeron gushed that Giles was the best wide receiver in practice while he was sitting out the 2017 season after transferring from Texas Tech. Unlike Burrow, he has skins on the wall. He caught 69 passes for 1,158 yards and 13 TDs as a sophomore for the Red Raiders. He’s draft eligible and not likely to stay if he has a big year in 2018 but he should get his chances in offensive coordinator Steve Ensminger’s pass-first offense waiting to be unveiled. Wide receiver isn’t exactly understocked at LSU but Giles is clearly the best player there with starters D.J. Chark and Russell Gage gone. Giles and could also win the punt return job. Thaddeus Moss, TE, 6-3, 247, So. : The son of NFL All-Pro Randy Moss but with a shorter, thicker build, Moss won’t oust starter Foster Moreau but provides a better receiving threat and, as we know, LSU is going to throw the ball a lot more. His size means he will be in the game to serve as pass protection at times, but LSU wants to get him the ball. As a freshman at North Carolina State, he played in five games and started three with six receptions for 49 yards and one score. LSU coaches have hinted the new offense will utilize all available receivers. Moss could a surprise threat. Breiden Fehoko, DE, 6-3, 298, Jr.: Another Texas Tech transfer, he started all 25 games in his two seasons in Lubbock and comes in a close second to Burrow at filling a need. 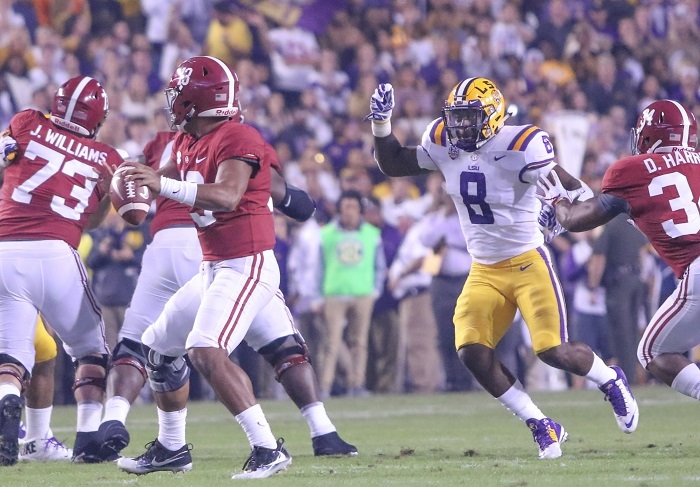 LSU lost three fifth-year seniors from last year’s front-line rotation and struggled there in the two September losses that nearly crashed the season. Like Giles, Fehoko has made his mark in practice, proving tough for Tiger offensive linemen to handle. He had 7.5 tackles for loss, two sacks and an interception. Along with Ed Alexander and Rashard Lawrence, LSU will have a formidable front wall and allow the younger talent to develop as backups. Terrence Alexander, CB, 5-10, 177, Sr.: He’s not a guaranteed starter but the former John Curtis star played 41 games at Stanford, but only one in his senior season. He was granted a medical redshirt after breaking his forearm in the season opener. He had 57 tackles and one interception but his experience will earn him playing time at a position where LSU has a dearth of talent. LSU had only four scholarship cornerbacks for spring practice. He could well end up as a nickel corner because of his playing experience. Cole Tracy, PK, 5-11, 182, Sr.: Orgeron showed he wasn’t taking LSU kicking woes lightly with this graduate signing. Tracy is another who may not win the job but will certainly make it more competitive after the Tiger kickers faded toward the end of the season. He made 27 of 29 field goals and scored a school-record 148 points at Assumption College. He won the Fred Mitchell Award which goes to the player from FCS, Division II, Division III and the National Junior College Athletic Association for excellence on and off the field. LSU kickers Jack Gonsoulin and Connor Culp combined to make only 16 of 27 tries. The margins are razor thin in college football and kickers can win you – or cost you – one or two games every year. Jim Kleinpeter is a graduate of the LSU School of Journalism. He sportswriter for 37 years, including 33 years at the Times-Picyaune. If the hypothesis being tested is “Can Ed Orgeron be the head coach of the LSU Tigers?”, the first two iterations of the Coach O experiment at LSU have yielded overwhelmingly positive results. Orgeron’s been just the catalyst the Tigers needed, following Les Miles’ sudden but not unexpected firing after LSU’s second loss before October. Following the same methods he implemented at USC in 2013, when he went 6-2 as interim head coach, Orgeron’s shortened and labeled practices — ‘Tell the Truth Monday,’ ‘Competition Tuesday,’ etc. — and increased film sessions to produce a team that’s, so far, looked sharper, fresher, and more dominant on Saturdays since his battlefield promotion. But the results of the experiment, while thus far promising, are insufficient. The conditions have been too favorable. Wins over Missouri, no better than the 12th-best team in the SEC, and a 4-3 Southern Miss team will earn Orgeron style points, but they’ll not land him his dream job. However, wins over Ole Miss, Alabama, Arkansas, Florida, and Texas A&M — LSU’s next five opponents — will do exactly that.